Ambassador Nikki Haley says UN Human Rights Council is "foolish and unworthy of its name" after it condemns Israel. U.S. Ambassador to the UN Nikki Haley on Friday blasted the UN Human Rights Council over its continued anti-Israel bias. 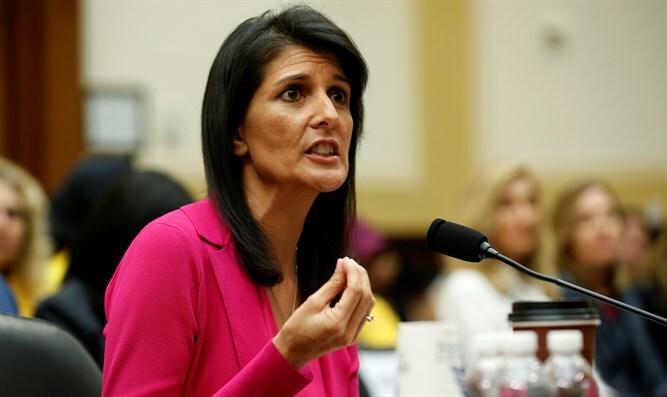 Haley issued a statement after the UNHRC adopted five resolutions condemning Israel while adopting only one resolution each against North Korea, Iran, and Syria. This has become an annual ritual, as every March, the Council sets aside only two sessions to debate human rights violations and abuses in all countries and another entire session just to debate a single country, Israel. “When the Human Rights Council treats Israel worse than North Korea, Iran, and Syria, it is the Council itself that is foolish and unworthy of its name,” said the American Ambassador. “It is time for the countries who know better to demand changes. Many countries agree that the Council’s agenda is grossly biased against Israel, but too few are willing to fight it. When that happens, as it did today, the Council fails to fulfill its duty to uphold human rights around the world,” she added. “The United States continues to evaluate our membership in the Human Rights Council. Our patience is not unlimited. Today’s actions make clear that the organization lacks the credibility needed to be a true advocate for human rights,” concluded Haley. The UNHRC is notorious for its anti-Israel bias. Several months ago it began sending letters to companies in Israel and around the world, warning them that they are about to be added to a database of companies doing business in Israeli communities in Judea, Samaria and eastern Jerusalem. The Human Rights Council voted to approve the database of companies in 2016, despite objections from the United States and Israel. The Trump administration has been trying to persuade the UN not to publish the list. Haley has routinely called the UN out over its anti-Israel bias. Last December, she called the international body a “hostile place for the State of Israel” and asked rhetorically why Israel would chose to remain in the UN given that body’s clear antipathy towards the Jewish state. "I have often wondered why, in the face of such hostility, Israel has chosen to remain a member of this body. Then I remember that Israel has chosen to remain in this institution because it's important to stand up for yourself. Israel must stand up for its own survival as a nation. But it also stands up for the ideals of freedom and human dignity that the United Nations is supposed to be about."